A shower head is one of those little things that help us have a better life though they don’t usually call attention to themselves. Unless of course you go out and pick up one of today’s versatile, rejuvenating, multi-setting, low flow shower heads. It’s hard to keep those puppies in the background because as soon as you install it everyone is lining up to get into the bathroom and experience it. And who can blame them? Whether you like your shower to mimic rainfall in the Amazon or the effects of a traditional Thai massage today’s shower heads have you covered. So sit back and take a look at our list of the 10 best shower heads for 2019. Then go get one for yourself and see what all the fuss is about. The AquaDance 3328 is the hydra-headed monster of contemporary shower heads. With a premium, 7-inch diameter rainfall head and a 4-inch multi-setting handheld shower head attached to the same base it gets you going and coming. Each head boasts 6 settings and you can run them simultaneously or switch between them. You’re also able to point each head independently to really ramp up the crazy. If showering is a passion the 3328 by AquaDance will speak directly to your heart. Be sure to also check out our list of the best camping showers for more great items like this. 7-inch face for drenching rainfall coverage. Chrome Plated Premium ABS and Stainless Steel. The Speakman S-2252 is a deceptive piece of bathroom hardware. It has the outward appearance of an old-school single setting shower but in reality, it’s one of the most versatile on the market. With 48 separate micronozzles that can be adjusted in multiple ways, the Icon delivers everything from a high-powered, highly concentrated stream to the gentlest mist you can imagine. Fashioned from solid brass and stainless steel this is likely to be a fixture (so to speak) in your bathroom for years to come. Resists bacterial and mineral buildup. Rust free stainless steel finish. The WASSA High Pressure Shower Head provides a range of shower experiences from pulsating massage to tropical rainforest. Which is pretty amazing when you consider they get all this variety out of a head that’s only 3 inches in diameter. 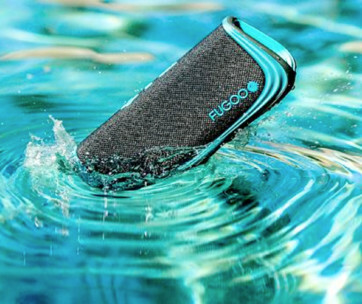 The Wassa features anti-clog, anti-leak technology wrapped in a handsome, corrosion resistant chrome shell. It installs in minutes, pivots to reach any part of the shower and with its self-cleaning nozzles, it’s good to go for years. G1/2” thread connects in minutes. Swivel head reaches any part of the shower. If you were wondering where all the recognizable brand names went here’s one for you. 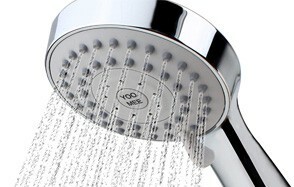 The Moen S6320 Two-Function head produces one of the most compelling rainfall shower effects you’ll ever experience. The S6320 features the company’s self-pressurizing Immersion shower technology that focuses water more effectively than standard shower heads. The result is an all-encompassing shower experience that’s as refreshing as it is effective. You won’t get 2 dozen different shower effects with the S6320. But what you will get is the kind of shower you look forward to every time. 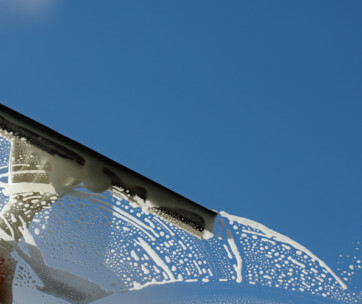 Our handy guide to the best shower squeegees features more great products like this. Brushed nickel and gold finish. Fits all standard shower pipes. Water from the municipal water system is loaded with chlorine, ammonia and other chemicals as well as calcium, magnesium and a rash of other minerals all of which can wreak havoc on your scalp and other parts of the body. If you have sensitive skin you know what a problem it can be. The Culligan WSH-C125 is designed to address the problem of hard water. It’s one of only a few high-end heads with a built-in filtration system that effectively addresses the bacterial and mineral content of public water systems. It also happens to look great and requires no tools to install. Compatible with any standard shower pipe. Flow rate of 2 gallons per minute. The Hydroluxe 1433 is another multi-pronged shower head designed to maximize your showering options. It features dual 4-inch chrome-plated heads; one fixed and one handheld. Each one features mist, massage, power rain, economy rain, and pause settings. Fire both heads up at once, use one at a time or combine different effects from the two to really create a memorable shower experience. The rub-clean jets let you keep bacteria and mineral buildup at bay and the 5-foot flexible stainless steel hose brings the handheld head wherever it’s needed. 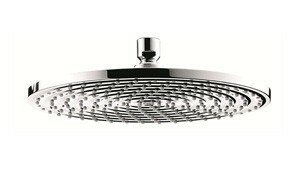 The Downpour AIR Showerhead from Hansgrohe does one thing and does it exceptionally well. It creates as close as you’re likely to ever get to a true natural downpour experience right in your home shower. The 10-inch oversized shower head contains a pretty incredible 180 QuickClean shower nozzles. As the water is pumped through the head it’s injected with air so that when it cascades out onto your skin it feels soft and rejuvenating. The Downpour AIR is going to cost you more than most other heads but if you crave a luxurious, refreshing shower experience you simply can’t beat it. Be sure to combine this with a cool shower speaker from our list. Flow rate 2.5 gallons per minute. Compatible with any standard shower connection. A full 10-inch diameter surface. The SparkPod is an unusually named but extremely effective and satisfying premium shower head that uses 90 anti-clog nozzles to provide you with a full, lush tropical downpour shower experience. It’s incredibly easy to install although installation may not be entirely tool-free as the PR states since you might need a wrench to tighten things down. That aside, the SparkPod effectively removes minerals that can build up in most shower heads and the cascade it produces has few equals when it comes to consumer-grade heads. While the pressure from the Yoo.Mee high-pressure head isn’t going to blast the hair from your scalp the pressure this innovative showerhead creates is noticeably better than what the city serves up without it. And that by itself makes it worth the price of admission. The 79 silicone nozzles provide a strong, steady stream that feels great. If it’s too strong you can just twist the adjustment lever and ratchet it down. There are no fancy pants antibacterial extras but one pass under the Yoo.Mee and you’re not going to miss them. Make sure you also check our guide to the best soap dispensers. Proprietary Turbo Charging high-pressure system. The DreamSpa 9 inch Rainfall Detachable Shower Head Combo is another twin headed shower monster intent on making sure you leave the shower enclosure feeling great. The fixed 9-inch square shower head provides comprehensive coverage of even the biggest person while the 4.75-inch handheld head makes it easy to wash the shampoo out of your hair and effectively clean out of the way places. As pretty as it is effective and with a lifetime warranty you really can’t go wrong. Extra wide 9 inch face. Dual shower heads, static and handheld. Brand - Just about everything having to do with the home has been affected by the shift in the manufacturing base to Asia. Whereas 20-30 years ago your choices of shower heads were likely limited to a few well-known American or European brands, today there are dozens of brands from across the Pacific few people have ever heard of flooding the market. Some are not worth the plastic they’re made of. But some are of extremely high quality and, because of their low price, are a significant value. We look at everything to find the best shower heads to present our readers. Reviews - Consumer reviews for shower heads tend to be pretty simple affairs: “Love it!”, “Hate it!”, “Does a pretty good job.” And so forth. They usually don’t reveal much except the writer’s personal preferences. Since our product reviewers all enjoy a good shower we relied almost entirely on their input for this list of best shower heads. Quality - There are plenty of shower heads out there that look great in the package. When you unbox them though it turns out that they’re not stainless steel but just shiny plastic. Or the adjustment mechanism that looked so simple and reliable actually snags every time you try to move it. While we’re not stainless steel snobs we insist that every item on a list like this be well-made of high-quality materials. If there is any plastic involved it needs to be high-quality ABS or something similar. ABS (Acrylonitrile Butadiene Styrene) is a highly durable opaque thermoplastic notable for its high impact strength. Design - One person’s masterpiece is another person’s garage sale item. Meaning that taste is subjective. What you love someone else may hate. What they think is ugly you may find beautiful. Therefore, it should be noted that when we comment on the design of this item or that we’re expressing our own opinions, which may differ from yours. Some aspects of design, however, are more objective, such as whether the weight of a shower head is nicely balanced. Or whether the mechanism that allows you to switch between one setting and another is easy to access and use. Price - Most heads cost about as much as a large pizza, or maybe two. Those like the Hansgrohe Raindance that clocks in at 300-400 dollars are the exception to the rule. Not the norm. As such price wasn’t a big factor in determining which of the current generation of shower heads deserved a spot on this list. Adjustable Shower Head Spray Patterns - Some folks like their shower head to envelope them fine, luxurious mist. Others want their shower head to pummel their back like a massage therapist to work out the stress and strain of the day. While still others enjoy the feeling of a heavy, steady downpour. The best shower heads provide you myriad choices so that everyone in your house emerges from the shower with a smile on their face. Fixed vs Handled - A hand-held shower head provides you with greater flexibility. You can hold it to target specific areas of your body as you shower, or you can fix it in its base and go all old-school. If flexibility is important to you then you should definitely go the detachable shower head route. If on the other hand, you’re one of those who doesn’t want to be bothered holding something while you relax in the shower (and there are millions of you out there) then a fixed shower head should be right up your alley. For some reason, fixed heads tend to garner more positive reviews than handheld ones too. Exactly why is something of a mystery. Water Saving - Water conservation these days is a necessity. So much so that many municipalities have regulations governing the type of shower head you can install. But even if you aren’t subjected to such regulations where you live (yet) water conservation is still every bit as important as energy conservation. So you should always look for a shower head that makes the most of the lesser amounts of water. Ease of Installation - Installing a shower head is typically a straightforward project. Essentially it comes down to unscrewing the previous one, cleaning off the threads and screwing in the new shower head. There are a few shower heads on the market that may involve a bit more work than that but even then any competent do-it-yourselfer should be able to handle it. Filtration - While some shower heads come with water filters installed most do not. Filters can be an important feature because a lot of municipal water is loaded with things like chlorine and ammonia which may irritate the skin. If your shower head doesn’t have a built-in filter there are several kinds on the market that can be installed fairly easily including carbon filters, KDF filters, bioactive filters, and even vitamin C filters. 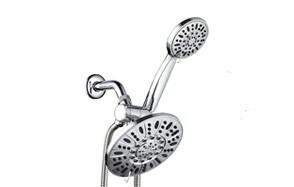 Single-Setting Shower Heads - This type of shower head offers only one type of shower experience. They’re either on or off and that’s that. While these are fast being replaced by multi-setting shower heads there are still millions of them in use worldwide. Multi-Setting Shower Heads - The opposite of the single setting shower head is the multi-setting shower head that offers an array of spray options from mist to spring shower to massage and everything in between. Low-Flow Shower Heads- The low-pressure shower head either generates an on again, off again pulse to reduce the amount of water being used or introduces air into the water stream to cut down on the amount of water. These are excellent environmentally and financially responsible devices every homeowner should look into. Rainfall Shower Heads- The biggest news in shower heads over the past decade has been the rise of the rain shower head. This notion of spreading the water out over a large area and allowing it to fall virtually straight down has caught the attention of the public. And now they’re everywhere. Some can be as wide as 8 or even 10 inches. With some custom jobs even bigger than that. Q: What is a Shower Head? A: A shower head is a device that attaches to the end of the water pipe the feeds water into the shower stall or tub area. It essentially accepts the water flow in its bulk form and disperses it over a wider area so that it is a more effective cleaning and relaxation tool. Q: Is the Shower Head easy to install? A: In a word, yes. In most cases installing a new shower head requires nothing more than unscrewing the old shower head, wiping off the threads, and screwing in the new one. Q: Will I need different spray settings? A: That is entirely up to you. Most people though choose to have a variety of different spray options available and there are a couple of reasons for that. First, because there is very little difference in price between a static shower head that offers only one setting and one that offers multiple settings. Second, there’s usually at least one other person in the house, condo or apartment. And different people have different preferences. Q: What makes a Shower Head Low Flow? A: There are 2 primary ways low flow shower heads restrict water flow. The first is to create a pulse. With this method water flows for a fraction of a second, is cut off for a fraction of a second flows, is cut off, flows, is cut off etc. This way only half the total amount of water is used. The other method is to introduce air into the water stream. This produces a physically lighter flow as some of the space within the stream is taken up by the air. Q: Can Shower Heads affect water temperature? A: It can in the sense that if you have a high flow shower head you’ll likely run out of hot water faster. Also, if your shower head is old the diverter valve, which is designed to regulate water temperature, may have worn out O-rings. In which case hot and cold water become mixed haphazardly and the water temperature can be affected. However, this is not a problem you’ll encounter with a new shower head. Q: How long do Shower Heads last? A: A good shower head is designed to last for years. However, as with most things in life, the less maintenance you do on your shower head the faster it will need to be replaced. Maintenance? On a shower head? Absolutely. Being that the shower head spends its entire useful life in the damp, warm confines of the shower stall it becomes a prime target for bacteria, who thrive in such conditions. Q: How do you remove mineral deposits from a Shower Head? Rub the nozzles directly - If the shower head has flexible rubber shower nozzles try rubbing them vigorously. This is often an effective way to dislodge bacteria. Soak the shower head in vinegar - Fill a small plastic bag with vinegar and wrap the open end around the shower head, fixing it in place with a strong rubber band. Make sure the shower head is completely immersed in the vinegar. Leave it like that for a few hours. Then remove the bag and run the shower for a few minutes to clear the vinegar from the head.